Here’s evidence the bull-market rally in developing-nation stocks hasn’t made them expensive. The earnings yield on the MSCI Emerging Markets Index has risen to the highest since November 2014 relative to junk-bond yields, meaning investors get a bigger return on investment from equities. 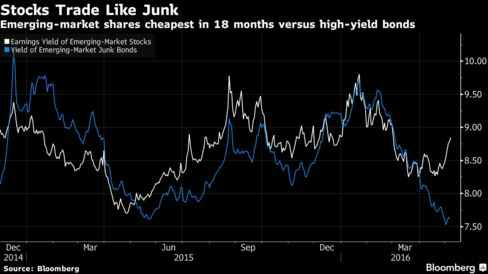 Analysts’ increasing projections for company earnings and a rally in higher-yielding debt in an era of negative interest rates are behind the divergence between stocks and bonds.